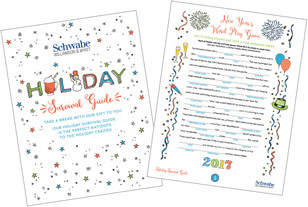 Holidazed and Confused: A holiday survival quiz from your friends at Schwabe. Our Holiday Survival Guide is the perfect antidote to the holiday crazies. This printable gift of joy is just a click away, and your reward for completing the quiz. Enjoy it with our thanks! As we close out 2016, we end the year with one thought in mind: No matter what's happening around us, we have set our compass to the true course—responding to our clients' needs. With this in mind, here's some fun for your holiday season. We hope you enjoy this holiday quiz and downloadable survival guide. May friendship and love be yours this holiday season.